A body was recovered from the wreck of the plane carrying professional football player Emiliano Sala, who was born in Argentina, and pilot David Ibbotson. The British Air Accidents Investigation Branch (AAIB), which revealed this late Wednesday, did not, however, give the body's identity. 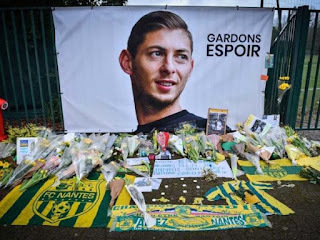 On January 21, the 28-year-old Sala was on his way from Nantes to western France to make his debut for the English Premier League team Cardiff City when the plane disappeared. The wreckage was found on Sunday after the English Channel's private underwater search where the aircraft crashed. The body was "successfully recovered," but attempts to recover the wreckage of the aircraft failed, the AAIB said in a statement. Due to "poor weather conditions," the agency said, the overall operation was brought to an end. Sala agreed to join the Welsh club Cardiff for a £15 million club-record fee from the Nantes French Ligue 1 club. It is believed that he and the pilot died when the single-engined aircraft of Piper Malibu crashed into the sea.